Food allergies may be the primary source for acne, according to Food Allergy Solutions. Any thing that affects the immune system and leads to inflammation can cause an outbreak of acne. If you notice that you only break out when you eat peanuts, discontinue eating them and call your doctor. You may have a peanut allergy. A peanut allergy is common among young children, but can affect adults as well. If you've been diagnosed with a peanut allergy, avoid consuming peanuts to prevent a severe allergic reaction. 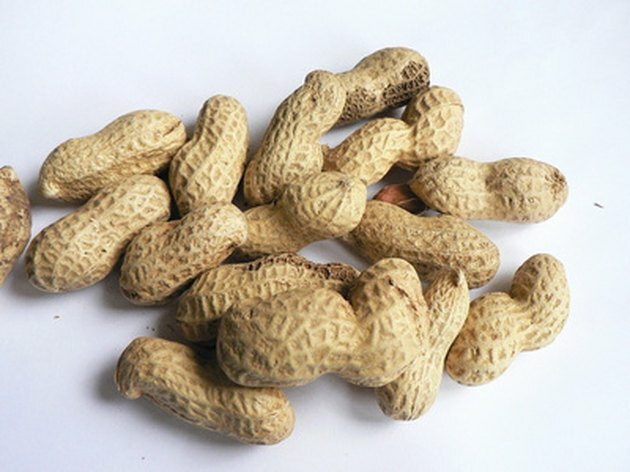 An allergic reaction to peanuts occurs because of a malfunction of the immune system, according to KidsHealth.org. The proteins in peanuts are not recognized by the body as a safe substance and therefore build a resistance towards them. The immune system attacks the peanut proteins with immunoglobulin E, or IgE, antibodies that attempt to fight off them off. The presence of IgE antibodies causes mast cells in the body to create a chemical called histamine. This chemical is normally used in the body to fight infection, but during an allergic reaction it causes inflammation in soft tissue, such as the skin. An allergy to peanuts will cause a continuous toxic reaction that can irritate the skin, according to Food Allergy Solutions. An example of this is the formation of hives, eczema and other skin rashes as a reaction to increased histamine levels in the skin. The body attempts to rid itself of the allergen and causes increased swelling and irritation in the skin. The skin becomes susceptible to infection that can lead to an outbreak of acne. Acne is not considered a common symptom of a peanut allergy, but is likely. MayoClinic.com states that the common symptoms of a peanut allergy will include respiratory complications, skin irritation and digestive issues. Respiratory complications may include nasal congestion, sinus pressure, a runny nose, post-nasal drip, difficulty breathing, coughing, wheezing and asthma. The skin can form a rash around the mouth or face that is itchy and inflamed. Digestive symptoms of a peanut allergy include diarrhea, nausea, vomiting, bloating, cramping, stomach pain and gas. If you are diagnosed with a peanut allergy, you are at greater risk of developing a severe allergic reaction, called anaphylaxis. Anaphylaxis can cause complications that can result in death, according to Kids Health. If you develop facial swelling, dizziness, metal confusion and rapid heart rate, call 911 immediately for emergency care.